Help young children learn about Jesus and grow in their understanding of God’s love for them. Preschool B lessons provide a framework for children to explore, express, create, and relate to one another each day. 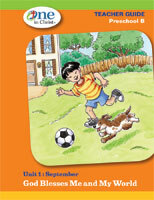 The Preschool B materials contain 52 weeks of materials for four days per week, plus one bonus lesson per quarter. Each daily lesson includes four sections that provide materials to use throughout the day. Purchase materials separately or save money with our quarterly shipment program. Unit 4: Happy Birthday, Jesus! Unit 12: I Am Jesus’ Disciple Too! Perfect for teaching Bible stories or for active play, Bible Play Scenes include a unique background and vinyl objects and characters that can be removed and reattached to create new scenes again and again. Books measure 9" x 12" and fold open to provide an 18" x 24" background. Capture student imaginations with Zippy! 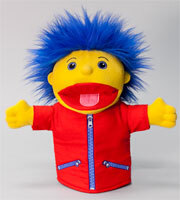 Each lesson includes skits for this friendly hand puppet. Teach children about God’s love through music! Including voice recordings and separate instrument-only recordings, the 3-CD set includes 45 songs for children to sing along to with joy and enthusiasm. The CD set and songbook are sold separately. 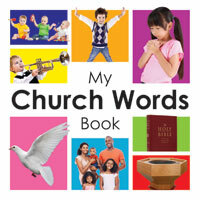 This 10" x 10" book introduces children to words and phrases they’ll hear in church. Pictures and words are arranged by themes, including church, music, worship, fellowship, holidays, and more. 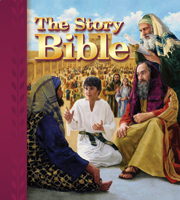 Share Bible stories through simple language and big, colorful pictures with Big Books! Great for classroom use or in chapel. Each book measures 15" x 18". Provide families with activity suggestions that coordinate with each theme their preschooler is learning that week. Each letter includes a bright Bible story picture, the weekly theme, a simple telling of the Bible story, Bible words to learn, and family activity suggestions. Order one per child or family. Units 1–9 and Units 10–12 sold separately. Make Jesus time part of your child’s bedtime routine with this book that offers 105 short devotions and prayers.